The music of Herbert Howells remains justifiably popular in Great Britain, and is becoming increasingly known outside the UK. He is perhaps best known for his choral music. It is easy to understand why, as anyone who has heard �Take him earth for Cherishing� or the St Paul�s or Gloucester Service Evening Canticles will testify. 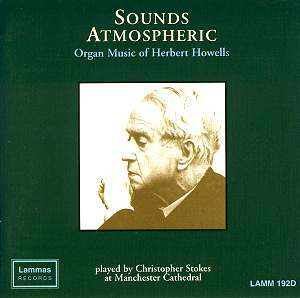 Howells� organ music has also found a firm place in the repertoires of British organists. Howells himself was only briefly a Cathedral organist, at Salisbury, and he assisted at St John�s Cambridge during the war. His use of the organ is, in the first instance, orchestrally inspired, just as the organs were which Howells knew. The organ of Manchester Cathedral, heard on the present recording, is then, in one sense, rather appropriate, containing as it does 73-note chests throughout, so that the octave-couplers work all the way to c61. This idiosyncrasy was introduced in the 1950s when the organ was substantially rebuilt by Harrisons to the specification of the then organist Norman Cocker, yes he of Tuba Tune fame. Cocker especially enjoyed playing orchestral transcriptions. At no fewer than 89 stops, the organ isn�t lacking in colour, its huge variety of enclosed 8� stops especially necessary in this repertoire. What is lacking is acoustic. Some more bloom in the sound would undoubtedly aid the warm, though sometimes dark and broodingly chromatic music. I wondered occasionally if Christopher Stokes could have used more überlegato to mask the lack of aural decay, though this is being really picky. It must be said that Stokes�s programme is essentially divided into two parts, so different is the late Partita, written for Sir Edward Heath. This gritty work receives as committed a performance as could be wished for. Stokes�s playing in general is excellent; sensitive to the detailed nuances of Howells� notated phrasing and using �his� organ to maximum effect. The Rhapsody No. 3 is given an especially gripping reading. A former Professor of Organ at Trinity College, and organist of St Martin in the Fields in London, Stokes combines his duties at Manchester Cathedral with a teaching post at Chetham�s. A very recommendable taster of some of Howells�s best organ compositions, all of which receive excellent performances.